It’s May 25 – Geek Out! Happy Geek Pride Day, everyone! Plus, there’s a whole day dedicated to geekitude. Geek Pride Day has been around for a half-dozen years. May 25 was selected as the official recognition day because it is the anniversary of the date the first “Star Wars” film (Chapter 4: “A New Hope”) premiered in 1977. According to Wikipedia, May 25 also serves as Towel Day for those who love The Hitchhiker’s Guide to the Galaxy (possibly a default, since no month contains 42 days) and Glorious 25 Day for acolytes of Discworld. So, grab your lightsaber, hang on tight to your towel, and revel in geekiness today. And, remember, Don’t Panic because The Force is With You. This entry was posted in Uncategorized and tagged Geek Pride Day by Vickie Bates. Bookmark the permalink. Geek Pride Day came and went and I didn’t do anything to celebrate it? If Tim and I had only known, we would have brought our Star Wars DVDs along to the cabin! P.S. The glasses-wearing dog photo is very cute! Awww, thanks. 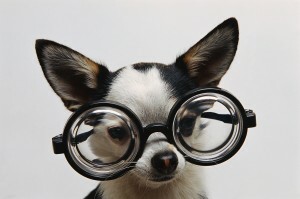 I was searching for geeky glasses and found this pup instead!